Monday's CES 2008 kick-off has already brought a larger-than-usual crop of Palm product leaks and rumors. Palm's aggressive Windows Mobile release strategy seems to be picking up steam, as The Boy Genius Report has posted some leaked Vodafone internal presentation slides that definitely let the cat out of the bag regarding Palm's two new WM 6.1-based Treos. 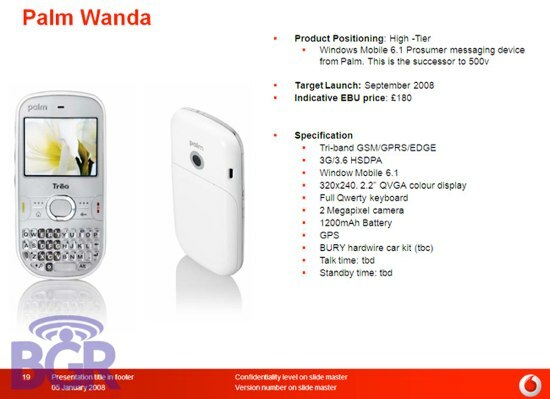 The first, codenamed the Palm "Wanda", looks to be a successor to the non-U.S. market Treo 500. The Wanda is being touted as a "Prosumer messaging device" and is directly referenced as being the 500v's successor. The leaked Vodafone slide reveals a phone basically identical to the earlier 500v as far as its cosmetics. The LCD is a carryover from the 500v (2.2" 320x240) as is the 2 megapixel camera. However, the "Wanda" ups the ante significantly in a radio upgrade to a fast 3G HSDPA radio versus the 500v’s slower UMTS while also adding 2008's hottest phone feature, built-in GPS. Unfortunately there is still no indication of a top-mounted mute/ring switch that was previously a Treo trademark until the arrival of the 500v. The pictured device is in white with no reference to alternate color availability. Additionally, the presence of only a tri-band GSM radio makes this look like another device that will never see the light of day in the U.S. market. According to the information obtained by BGR, the "Wanda" will reportedly launch in September 2008 for 180GBP, roughly equal to $355 USD. and i think that's what they desperately need. easier said than done. I think it's just another Palm killer. But, I don't love that they seem to have standardized on the Centro's design queue's. For one, I think there should be stronger visual branding between their high and low end phones... they shouldn't sell a high end phone that looks more or less just like their low end. And also I was just seeing that this phone is kind of unpleasantly asymmetric where the top of the phone has rounded corners with a small radius than the corners at the bottom. The difference is not big enough to be a statement and kinda just bugs me, they should have kept the thing more even. I guess that's just nit picking, the big news is that this thing isn't coming out till end of 2008. Sigh. This is the most attractive thing by palm yet. Uh, it doesn't look that nice. But I like it. - GPS... that is something that I might find a use for. - No OLED. I think Rubinstein is brainwashed already by the Palm team who feel that oled cannot be seen in sunlight, which is total hogwash. I heared him make a comment about the importance of being able to see outside. I just know he was making an excuse against OLED.